In this module, you will install Paratext 8. Paratext is the world’s leading software application for the development and checking of new Bible translation texts, or revisions to existing texts. Developed jointly by UBS and SIL International, it enables consistent and accurate translation, based on original texts, and modelled on versions in major languages. Due in part to its cutting edge collaboration features, Paratext greatly assists in producing higher quality translations in much less time than previous tools and methods have allowed. You have already installed Paratext 7 and now want to install Paratext 8. Paratext 7 and Paratext 8 can both be installed at the same time but you need to understand the limitation of using them together . They use different data directories. You will install Paratext 8 (without uninstalling Paratext 7). You will also install an update from an MSP file. Note: you do not need to uninstall Paratext 7 or earlier. But you may need to uninstall an earlier version of Paratext 8. Double-click on the installer file. This step might take a few minutes if the installer needs to install the .NET 4.5 Framework on your computer. If a dialog appears and asks for your permission, click Yes or provide the credentials as required. A welcome message is displayed. The destination folder step appears. Accept the defaults for the folder. Note: Paratext 8 data may not share the same directory as Paratext 7 data. Click Finish and then Close. The first time you launch Paratext 8 you will need to enter your Paratext 8 registration code. Information on how to obtain this code is on the Registration page. All users need a new registration for Paratext 8. After you download and install Paratext, you must register yourself as a user. You cannot open Paratext to create a new project without first having registered as a user online. Go to https://pt8.paratext.org/registration/ and register yourself either as a user or as an organization. If you want to create a project, you must have the approval of an organization such as SIL, but if your organization is not listed, you must ask permission to create one in order to publish your work or you can request independent translator status. There you will come to a sign in page in which you fill in your email address. You can choose to link this to a Google account if you have one. Next, create a password of 10 or more characters and confirm the password. You will then be sent an email with a link to proceed with the registration process. If you cannot find the email, check your spam or junk folder. Once you have user information, open Paratext on your computer and pick the interface language you want to use to edit the project (not the language you are translating). You may then enter the registration information you were sent. 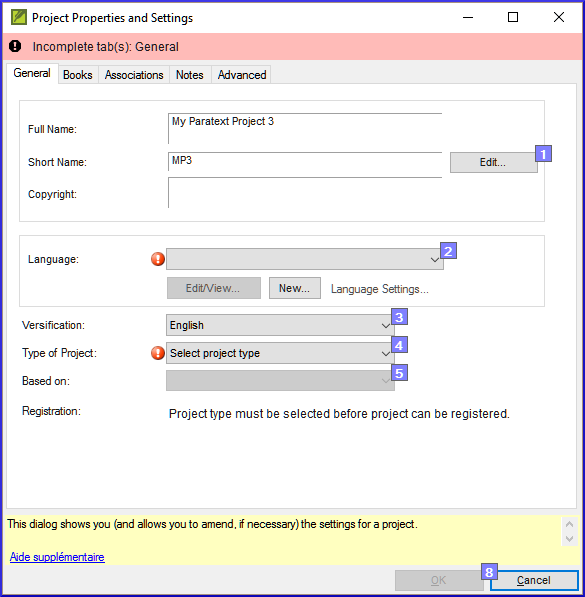 After you enter this information, Paratext will open with a popup screen called “Project Properties and Settings” that will allow you to begin the creation of you project. More details about creating a Paratext project can be found in section 2.3 below. When you have finished filling out the basic information, you will be redirected to the Paratext website to register your project. More details about this can be found in section 2.2.2 below. The new update files have a .msp extension instead of PUD or SPUD as in the past. Make sure Paratext is closed. Double-click on the msp file to install the update. Migration is the process of moving a project (including all settings files) from Paratext 7 to Paratext 8. This is similar to the process of setting up S/R for the first time in Paratext 7.x. Note: all users of a project have to migrate at the same time. You have already installed Paratext 8 and you have a Paratext 7 project that you want to use in Paratext 8. 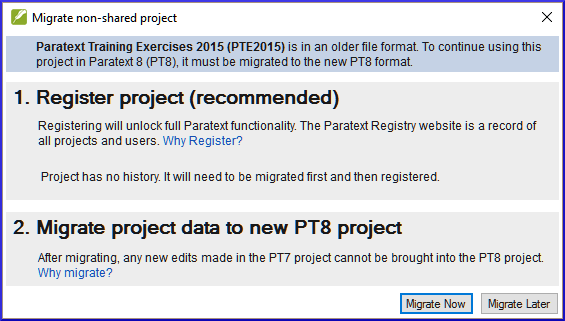 In order to get the full functionality of Paratext 8 your project needs to be migrated. Paratext 7 and Paratext 8 use different send/receive servers so there is no way for a project to be shared with some users on Paratext and some users on Paratext 8. It is also hoped that the old (Paratext 7) server will be closed down at the end of December 2018. So it is important to migrate as soon as possible. Users can have both Paratext 7 and Paratext 8 on their computers at the same time, and run one or the other, but no project can be shared simultaneously with users in Paratext 7 and other users in Paratext 8. Once you have migrated the project, everyone on the team needs to get the migrated project, and only do work in Paratext 8 from then on. You need to have a good Internet connection to migrate the project, but if you usually work without an Internet connection, you can keep working that way in Paratext 8 once the project is migrated. 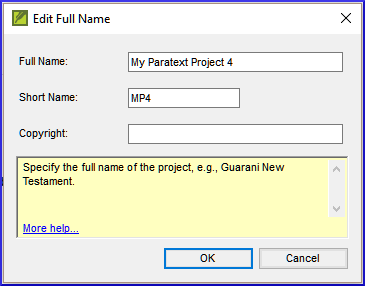 If you administer a project that is shared in Paratext 7 and you want to migrate it to Paratext 8, this is how you need to proceed. All your users have to upgrade at the same time. All users must do send/receive in Paratext 7 (then cease working in Paratext 7). The Administrator then confirms that the text is in a good state. The Administrator then loads Paratext 8. Choose the project to migrate. Some active Paratext 7 projects have been registered already for Paratext 8. If yours is one of them, Paratext 8 will show the project as P7 but show it as registered. 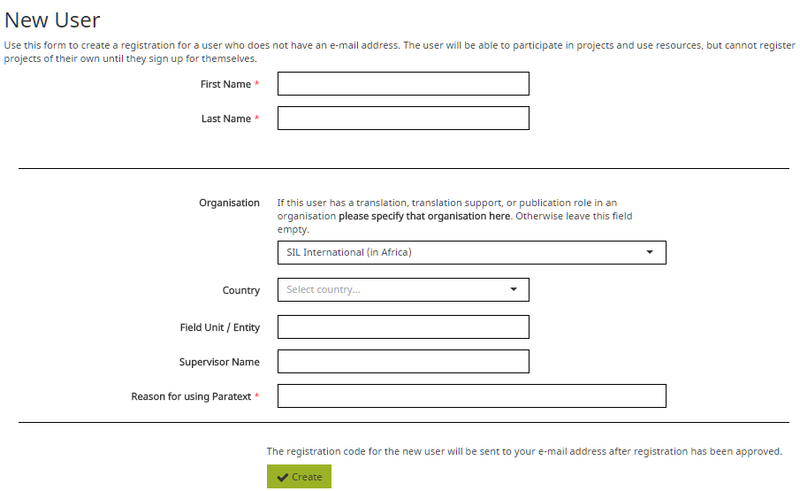 You can skip the registration step we’ll show you if your project is already registered. Click OK to start Migrating the Project. The ‘Migrate shared project’ dialog is displayed. Paratext 8may tell you the project must be registered (if it is not preregistered) and it must be migrated to Paratext 8. Long project name: You can change the long project name. Paratext 8 requires a language identifier for your language. Use the search in the language name to find the ethnologue code for your language. You can modify the language name, or use the “advanced” to specify or create additional information about the language. Scope refers to whether the project will be a complete Bible, or complete Bible including apocrypha, or New Testament, or some other grouping of books. You can add more books to your project scope later as this can be changed after registration. Translation type refers to whether it is the first translation for this language, a revision of an existing translation, or a new translation, or a translation including study materials, such as a study Bible. For a revision, you have to specify that you have permission from the rights holders of the translation you are revising. The rights holder would be the organization you expect will have the copyright for a print edition. This too can be changed if it needs to be later on. You can mark if your project is confidential or not. Only Paratext 8 registered users can view the name of standard projects, a confidential project will be hidden even from other Paratext 8 users. Another option is to mark a project as a test or training project. You can use this option for test projects you create, or for projects you use for practice in a training course. The last requirement to register is stating that you agree to follow the FOBAI guidelines in your translation project, and you agree to store a backup copy of your project in the Digital Bible Library. The Digital Bible Library is a tool for making translations available online or for mobile users, but your project will not be available to anyone until you agree to make it available. To submit the registration, click Submit Registration. The registry should tell you that the project registered successfully. (You may need to scroll to the top of the page to see this). It should detect that the project is now registered, and inform you of that. The migration step has several boxes you have to check off to verify that you understand what is involved. Put a check in these boxes if they are true, then click Migrate now to proceed. If you need to do something else before you are ready to migrate, click “Migrate Later,” and go finish your preparations. When you click Migrate now, Paratext will copy the project from your Paratext 7 into your Paratext 8, and will also do a send/receive to the Internet. 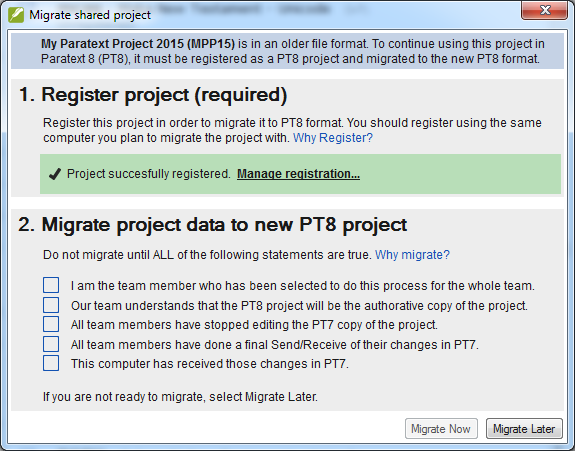 Now your colleagues can go to Paratext 8and do a Send/Receive to receive the migrated project. Language identifier: After you click “Migrate now”, Paratext 8 may tell you that need to specify a language identifier for your project. 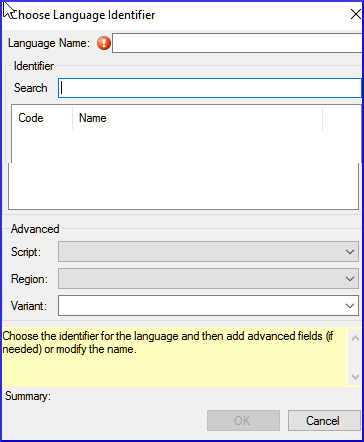 You can verify what the language name and language identifier are for your project by going to Project > Project Properties and settings, and looking at the language settings. The language identifier is either in brackets after the language name, or listed separately below the name. Books The project properties and settings has a Books tab, you specify here the books that you plan to track their progress in your project. You can choose book by book, or specify Old Testament, New Testament, Deuterocanon by using the buttons. You can change this list of books later on in the project if your plans for the project change. Note: Once you have migrated your project, you need to migrate the back translation and any other daughter projects (one after the other). If a project was not shared in Paratext 7 then you do not have to register it in order to migrate. 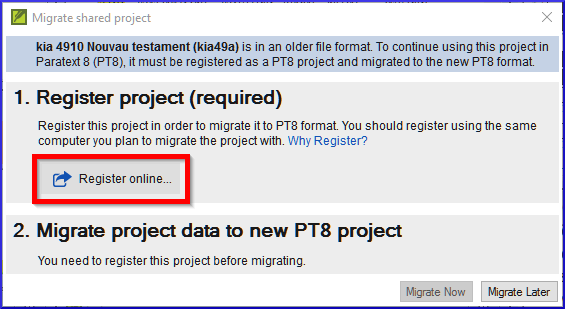 When you click “Migrate” the project will be migrated to the Paratext 8 folder and ready to be used. The registration status will determine what functionality exists for the project. Note: Non-shared projects don't have to be registered but it is recommended. Remember, no one should edit the project anymore in Paratext 7. That would be wasted effort as no one else will see their changes. To help your team members remember this, you could have them remove the project from their Paratext 7 once they have gotten it in Paratext 8. Or maybe they can uninstall Paratext 7 from their computer if they don't need it for other projects. Starting with Paratext 8 it is a requirement that projects share their basic metadata information with the translation community. It is strongly encouraged that they share progress information [some organizations and/or donors may require this]. Paratext 8 has been installed on your computer and you have the Paratext 7 registration codes for your team members. You will see what information is displayed in the ParaTExt Registry for a registered project. Go to (( https://registry.paratext.org|https://registry.paratext.org )) in your web browser. The “Sign in” screen is displayed. The site will check if your account exists, and if it is on a Google server, you will have the choice of authenticating with Google. A new screen is displayed asking for your password. Enter your Google account password. Click yes to authorize the Paratext site to use your profile information. You are then ready to start filling in your Paratext registration. 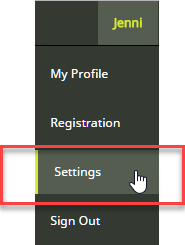 Click the appropriate circle to choose your registration type (new registration, previous Paratext 7 registration, or previous Paratext 8 registration). Choose your organization from the list, or if you are not a member you can leave this blank. Anyone can register to use Paratext, but people who are not members of a translation organization and who are not members of a registered project will not be able to use all the features of Paratext and will have access to only a few resources. Explain why you want to use Paratext. Check the box at the bottom if you want to get émail announcements about Paratext updates and news. The server will give you a code. It will also send this to your émail. If your email account is not on a Google server, or if it is but you choose to not use Google to authenticate, the registry server will ask you to enter a password. The server will send an email to your account with a link to verify. Open your email, go to the link, and proceed to register for Paratext (see 3.3: Filling in the registration). There are many reasons why you may need to change your Paratext code, particularly if your computer is stolen. Go to the registration website, (( https://registry.paratext.org|https://registry.paratext.org )) . Click on your user name at the top left. Beside Paratext 8, click Settings. The registration Details screen is displayed. Click on the Generate button to generate a new code. The code will be sent to your email address. If it connects to the Internet it will detect that the old code is no longer valid, and it will ask you to update your registration info. Go to your email, and copy the new code. It may already have pasted in your new code. If it has not, paste in the new code into the registration form, and click OK.
You will need to do this on any other computer that your Paratext code is installed on as well. Tools > Registration Information and paste the code there. Check your email for the code. Any administrator of a registered project can create new user registrations if they need to add people to their project. These users do not need to have an email address. Log in if you are not already logged in. Click the “+ Register new user” button. The new user registration form is displayed. Fill in their name, and the rest of their information. A user added by someone else cannot be made an administrator of a project, nor a consultant. If you would like to make someone a consultant or administrator they can register themselves for Paratext, then you can add their name to the project. The server should respond by e-mailing you the user code for the new user. In this module, you will create and register a new project. You have already installed Paratext and registered a user. A new aspect in Paratext 8 is that projects need to be registered as well as users. This may feel like an extra complication, but it does offer benefits to users. As we saw in the user registration section, the project administrator can create registrations for users they want to be part of their project. We will create and register a new project. The New project dialog is displayed. In the name section, give the project a name and a matching short name. If you have another Paratext project in the same language, you can just pick the language from the list in Paratext . If not, you will need to create a new language. The Choose language identifier box is displayed . Paratext will display matching names. Click on your language in the list. Paratext will add the language name. Fill in the advanced fields if necessary. You can also specify additional information if needed in the “advanced” section of the language settings dialog. Choose the appropriate type for your project. If it is a back translation, or a daughter or transliteration project, you will need to define the source. Make sure you have given the project a name and chosen the project type. Click Register to submit and return to Paratext. Click OK to create the new project. Projects that inherit their inscription from the parent project. As you work in your project, you can change your registration information later on. Click the “Manage registration” link. This will bring up the project registration info and you can edit it. Any project administrator can edit the registration info. 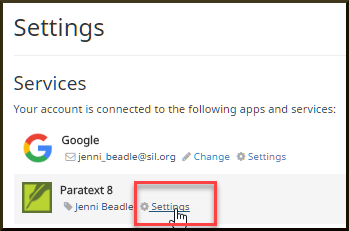 You have already installed Paratext 8 and registered a user.Why is this important? 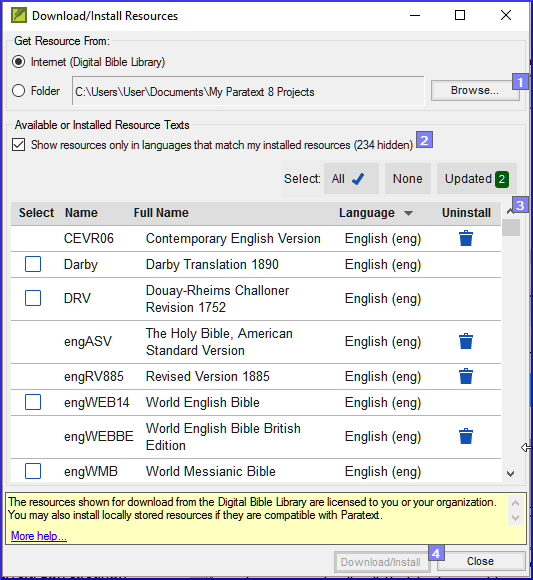 In Paratext 8, the resources are downloaded from the DBL (Digital Bible Library). Each user can download them directly, but if your Internet connection is limited, you can share the downloaded files with other users.What will you do? Download resources from the Internet. Install resources from a downloaded file. From the File menu, choose Download/Install resources. Make sure Internet has been chosen. Click the check boxes to the left of the desired resources. Go to the folder which contains the downloaded resource files. “Progress tracking” based on a Project Plan and Assignments and Progress is a new feature in Paratext 8 that will impact the day-to-day work of translation teams. Before you can add the plan the project must have been created/or migrated. The Project Plan feature allows the administrator to define a set of translation tasks that your translation project will follow. Paratext comes with sets of pre-defined plans from the various Bible translation organisations that you can use a starting point. However, every project is different and therefore after adding the base plan it will need to be modified for the team. Typically, organizations want conformity at the “Stage” level in order to facilitate meaningful tracking of the progress of project across the entire organization. However, every plan will need to be customized at the task level. If a task is important to you and your team and you want to track its progress, then it can be included in the project plan (even if it doesn't require Paratext to do the task). You will use a combination of two features: the Project Plan and the Assignments and Progress (sometimes referred to as “progress tracking”) to manage the plan by assigning team members to tasks, and tracking their progress in completing those tasks. Assign the tasks to the various team members. Click the Copy Plan arrow. The plan and its tasks are added to the project. If the project has an old plan, you need to delete each of the current stages before adding a new base plan. Click Yes (twice) once to confirm you want to modify the plan, and again to confirm you want to delete the tasks in the stage. It is possible to reorder tasks and even move tasks to another stage. However, not all organisations permit this. Click the Stages / Tasks tab. Select the task you want to move. Click the up arrow or the down arrow to move the task to a different point with respect to the other tasks, or to move it to a different stage. You may get a messages asking to confirm. Click on the task which is above the new task. Type the name for the task and a description. If necessary, edit the description. Choose the books that you want to track progress. Note: Follow the steps below to copy a task from a defined project plan to the project plan for project. From the File menu, select Open Project/Resource. Select the target project and click OK.
From the "Show Base Plan" drop-down, select the project plan that contains the desired task. 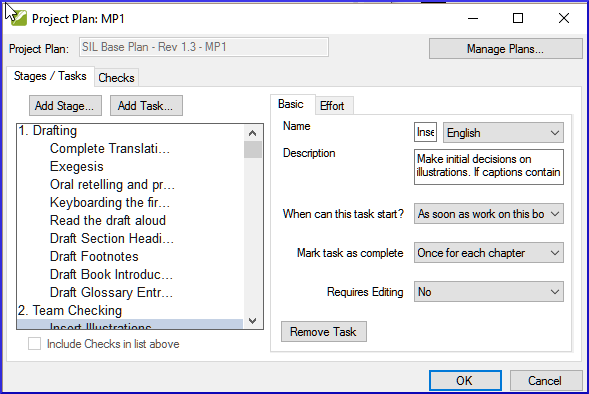 On the Current Plan side of the dialog, click the row that has the task which should precede the new task. If you want the new task to be the first task in the stage, select the stage name instead. On the Base Plan side of the dialog, hover over the task you want to add and click the solid blue arrow that appears. The task is copied to your project plan and cannot be copied again into this project. Optional: To move the task, click the up arrow or the down arrow that appears when you hover over a task on the Current Plan side of the dialog. Click OK to close the "Manage Plans" dialog. Click OK to close the "Project Plan" dialog. The copied task has the same name and progress rate as it had in the project plan for project ORIG. The short name of the project is added to the plan name. For projects that have already completed a number of stages at the time of switching to Paratext 8 the Tasks table view and/or the Stage table view of Assignments and Progress can be helpful in marking multiple books, stages or tasks, as complete. From the Project menu, choose Assignments and Progress. Check the box for the stages of each book as appropriate. The stage will be marked as complete unless errors have been found. The errors must be corrected before the stage can be marked as completed. Paratext 8 will likely find errors for most older projects since new checks have been added. When a project is brand new there aren’t a log of settings that can be fixed in concrete. As the project matures some of the inventories begin to make sense.Who is working on the project? Would it be helpful to have a “Simplified Menu”?Do you need to customize the settings? colour to help identify features? identify verses that are different from default versificationWhat orthography will be used? Put the orthography in the language settings. (Keep in mind that what you put in the language settings could be going to the “Speech and Language Data Repository”How will the characters be keyed? AutoCorrect.txtWhat Quotation system will be used? Look for options in the inventories! What book names are you using? What is the format for a reference? Where will you put the origin of notes? If you have ever needed to rename your project, reduce the size of your project, change user names, change the encoding or struggled with composed/decomposed diacritics, then the convert project tool will help you solve these problems. You must be the administrator of the project to do these conversions. Although, it is possible to make some changes to existing projects through the project and setting dialogs, several major changes require that a new project is created. Using the convert project dialog allows the new project to keep the project history. We will work through the six changes that can be made to your project. Enter the new short name for the project in . Select this if you have deleted files (such as large illustration files) that you no longer want to be part of project history and no longer want in the project repository. 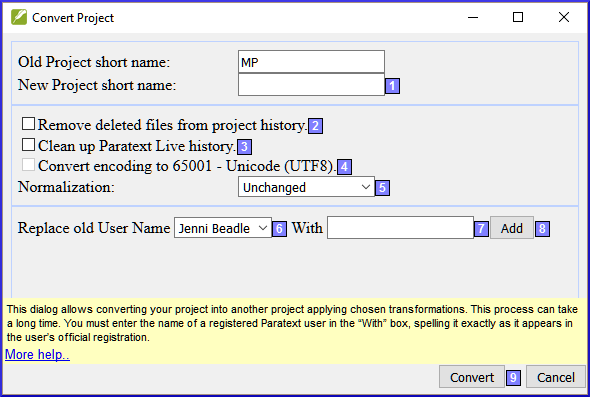 Select this if you have edited the project with Paratext Live and want to replace names in the project history. Select this to convert a standard project encoding to Unicode. NOTE: This will not work to change the encoding if your project has a "hacked font". Select Composed (NFC) or one of the options in the drop-down list if the data in your project was created using a mix of composed and decomposed characters. (See the Guide for more details). Select the name of the user you want to replace from the drop-down list. Enter the name of a registered Paratext user in this box. Add, a summary of the replacement appears, with a "Remove" button. Click OK to convert the project. See the note in the guide regarding shared projects. Most languages do not have access to concordances and other Bible study materials in their own languages. Adding cross references to your New Testament can greatly help your reader understand the text by helping your reader find passages on similar themes. Before you can insert cross references from a model text your administrator must have created all the books (and chapters and verses) in your project. They can be empty but they must be present. Reading the New Testament is not like reading a novel. Having access to cross references allows your reader to find similar passages. Nevertheless, adding cross references one by one is too tedious. 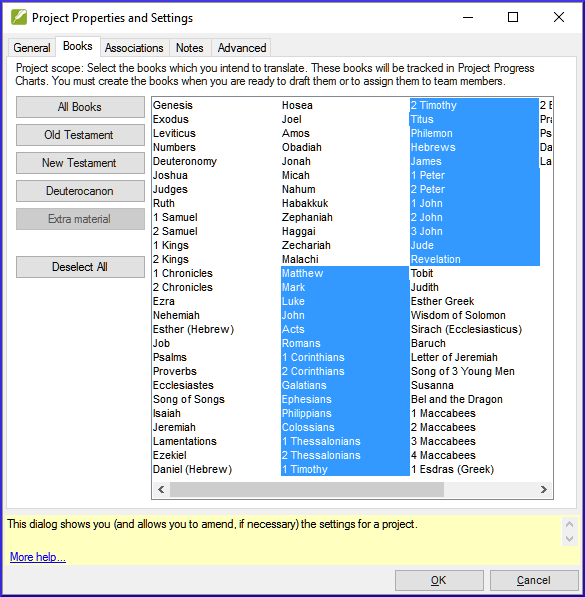 The Insert cross reference feature allows you to insert all of the cross references at once and also converts the book names and punctuation to match your Scripture reference settings. Extracting cross-references from a model text allows you to easily insert the same cross-references. We are going to do three things: export the cross reference from a model text; then make sure all the settings for book names and scripture references have been entered for your project; and finally insert the cross references. If you don't have a model text with the desired cross-reference, you can create your own list and import it. Note: Resource texts may not allow you to extract cross references. 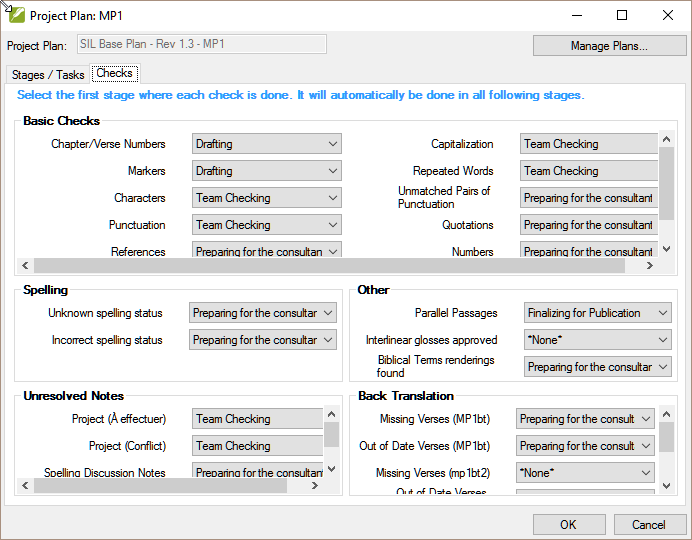 From the Project menu, select Scripture Reference Settings. The punctuation on the Reference Format tab. The book abbreviations on the Book Names tab. Click the Other Characters tab. In the Verse segment characters box, enter at least six different characters separated by spaces. From the Tools menu, point to Cross References, and then select Insert Cross References. Find the .xrf file of extracted cross references. Select the file, and click Open. If the Copyright box displays a copyright notice or required statement of acknowledgments, copy the text, and then paste it wherever you keep this kind of information for the project. Contributors to this page: megan_mauterer and matthew_lee . Page last modified on Wednesday September 12, 2018 15:34:25 GMT-0000 by megan_mauterer.